Collections help you store your assets in order and navigate through them fast. You can see your entire tree of collections in the left side panel of the main Pics.io screen. All the collections are arranged alphabetically by default. When you create a collection in Pics.io, a corresponding folder is automatically created in your Google Drive Pics.io folder after sync. What can I do with my collections? Once you locate the mouse cursor on the name of the chosen collection in the tree of collections, the whole line becomes gray offering you several buttons to utilize. “Upload a file” button allows you to upload the document directly to the chosen collection. “Create nested collection” button allows to create a sub-collection within the selected collection. “Add to Favorites” button gives a “star status” to the chosen collection and automatically places it into the “favorites” folder so that you can find it even faster. “Publish to web" button starts the process of creating a website out of the files in the chosen collection. “Rename collection” button allows you to edit the name of the chosen collection. “Delete collection” button allows you to delete the chosen collection alongside with all the assets inside this collection. If the assets from this collection are attached to other collections or lightboards, these files will be removed from those collections (lightboards) as well. How can I upload assets to my collections? There are several ways to add a file to a certain collection. Utilize “Upload a file” button after you choose a collection from your collection tree in the left panel. Choose a collection you want while going through the general file uploading process. Simply drag and drop your file into a collection you need. Can I keep assets in more than one collection at a time? Yes, you can keep your assets in several collections at the same time. To understand which collection a file belongs to, look at its thumbnail (below) or open the Infopanel by clicking on the ‘i’ icon placed in the top right corner of the screen. NB There’s one important comment here, however, for those who use Team Drive. The latter restricts the location of your assets to only one folder within Team Drive. It means that you can’t keep your asset in more than one collection. Read more about integration with Team drive here. How can I copy files from one collection to another? Open the collection you need and select the files you want to copy to a different collection. Drag and drop the selected assets to any other collection from the tree of collections you can see on your left. NB If you work with usual Google Drive, the assets are saved in both collections. But if you use Team Drive, the assets are actually moved from one collection to another, i.e. they can’t be saved in both collections at the same time. Is there a way to create a private collection in Pics.io? Sure. Besides shared collections, you can also create personal collections which are accessible and visible to you alone. These are lightboards. Read more about them here. How can I restrict access to certain collections? Sometimes you need to restrict access to certain collections for particular teammates. To do so, you should go to Settings - My team - Roles. There you should click on the "paperclip" icon and select collections that you want to make visible for particular roles. In other words, in Pics.io you can open access to roles rather than actual teammates. How can I locate assets that do not belong to a certain collection? Click on the magnifying glass icon in the very left panel of the screen to select Saved Searches. By default the top folder here will be "Uncategorized search”. You can find your "homeless" assets here. Use a checkbox at the bottom of your collection tree that says Don’t show assets in nested collections. 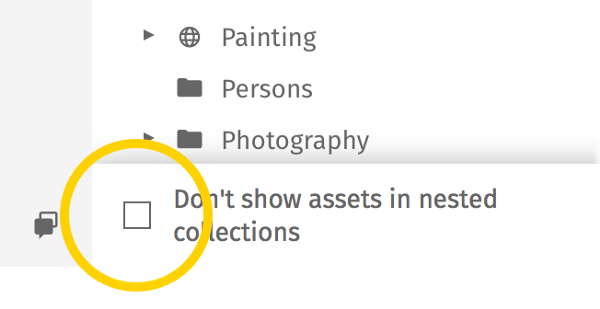 Once you select a collection and tick this checkbox, Pics.io will show you only those assets that do not belong to any nested subcollection within this selected collection. It means that you will see your “homeless” files separately and sort them out the way you think fit. You may be also interested to learn more about how to remove files from collections here.